"Specialist UK Manufacturer of Bespoke Orangery Roofs Systems & DIY Kits"
If your existing roof lantern on your Orangery has succumbed to age, wear and tear or has been damaged / is leaking or needs renovation or complete replacement then why not send through your replacement requirements along with any photos and colour references, dimensions, features etc. so that a member of our team can evaluate what is required. Our like for like replacement service will allow you to have your lantern replaced exactly to the same specification (with optional / additional weather protection, glass features etc.). Please note that our roof systems are available in timber, oak, pine and aluminium but not in uPVC. We can and do supply Aluminium Orangery Roofs and Orangery Roof Kits as well as Window units (double and triple glazed) with solar / easy clean glass. Roofs for an Orangery Cost anywhere from £1000 - £5000 depending on the size and configuration of the lantern. Those who live in period properties might want a more traditionally styled orangery roof, and because we create wooden roof lanterns, it’s easy to get that classic look. You can go for simple stained oak or hardwood, or choose from thousands of RAL / BS colour options. We can then add details such as ornamentation to give your roof a decorative finish. Have a non-standard sized conservatory or orangery? Not a problem. We create standard, made to measure, and bespoke roofs and complete glass roof systems in kit form, so no matter what your requirements, we can help. We use modern materials and manufacturing techniques to ensure that all our Orangery Roof products are energy efficient. Using modern glazing, they trap heat inside during the winter months, and panels can be opened during the summer when you want to cool things down. Our glass roof lanterns, skylights & rooflights are made to the highest standards, with mould-proof, rot-proof wood, so they stay looking good for years to come. Easy Installation Our roof lanterns are easily installed onto an existing orangery. Full instructions are supplied, and we can install roofs in London the South East and around most of the UK, or deliver the roof to be installed by a builder or as a DIY project. If you’re looking for a new roof for a orangery, simply pick up the phone and get a quote today on 0333 335 5051. If required we can provide guidance on orangery roof installations if you are purchasing the lantern as a kit. The installation will depend entirely on the pre-existing structure and configuration of the orangery. To discuss any techincal specifications or requirements why not give our techincal team a call. Each lantern will come with full step by step instructions on how to assemble the orangery roof lantern, the rafters, joints, window units, structural cassettes & more. New / replacement lanterns should not require any change in planning permission as long as the replacement roof falls within the regulations. The rules on Orangery roofs vary but generally a replacement will not require planning permission unless the size of the lantern changes. Our team can assist you with all planning enquiries. Each Orangery Roof Light / Lantern system will have varying installation requirements which can be dealt with by a competent builder / installer. We provide full Orangery Roof Construction Details with each kit. We deliver anywhere in the UK mainland, delivery costs vary. Our sales team can provide an indication of delivery costs depending on your enquiry and location. 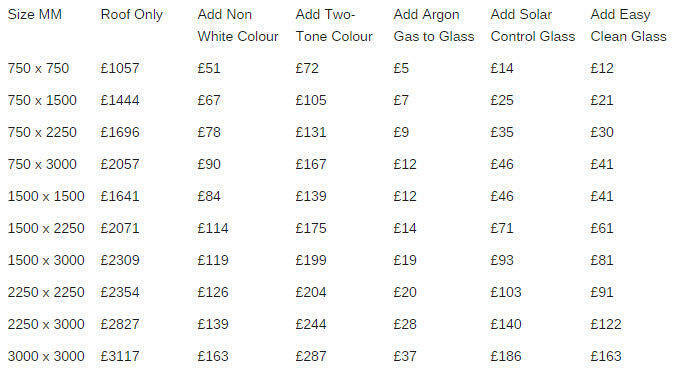 Orangery roof costs generally start from £1000 +VAT, the price will be dependent on the size and options, finish and glass type. We provide quick quotes either over the phone or, if you fill out the call back form above a member of the team will give you a call to discuss. Orangery costs are wildly different from replacement roof costs so to discuss either please contact us to speak with a member of the Orangeries UK team. Check out the pictures above or visit the gallery to view our range of roof lanterns for Orangeries. We offer a range of different styles which include Timber Orangery Roofs, Oak Orangery Roofs, Pine and Aluminium Roofs. We can provide roof lanterns in a standard primer ready for painting, or, we can paint to any colours you require (we can also colour match). We also provide replacement skylights, rooflights, roof windows & other orangery roof components. Our orangery roof systems are completely bespoke as they are made to fit existing or new structures. We can manufacture a system to fit your requirements. Our systems come complete (frame / fixings / glass units etc.). If you are looking for an orangery roof kit look no further. We are one of the leading orangery roof manufacturers around the UK and have provided bespoke lanterns and roofing systems to properties around the UK. We offer a short lead time and fast product delivery. If your conservatory roof is damaged, leaking or is in need of refurbishment/replacement then we can help. Conservatory roofs over time can deteriorate from weathering, UV damage, moss/mould or impact damage. Seals and gaskets can also perish over time allowing water to pass through into glass units or into the conservatory itself. Here at the Orangeries UK joinery, we specialise in conservatory roof replacement for both solid roof conservatories and tiled conservatory roofs. We can design, replace and provde you with a new conservatory roof to match the exact specifications of the existing roof with additional weather proofing or glass options such as solar glass / self cleaning glass. For Conservatory Roof prices please call us on 0333 335 5051.